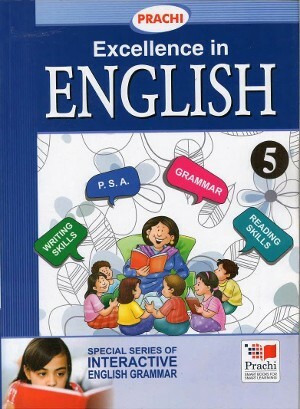 Prachi Excellence In English For Class 5 - Excellence in English, the new revised edition is a comprehensive course designed to meet the upcoming challenges and the needs of the students. Excellence in English, the new revised edition is a comprehensive course designed to meet the upcoming challenges and the needs of the students. This new edition aims at inculcating creativity and stimulating the learning abilities of the learners. The overall layout has been retained but the syllabus has been divided into Term – I and Term – II. The exercises have been modified and MCQ have been added wherever necessary. The suggested division of Interactive English Grammar into three sections is to make the class room teaching easier. The teachers can make changes according to their specific needs. ASL (Assessment of Speaking and Listening) included in middle classes (VI, VII, VIII) are meant to inculcate effective communication skills and to make students confident and help them to express themselves in a better way.